If you have received a disk space warning email such as "Mailbox approaching limit" which reads "You are now using over 75% of your allocated mail storage quota" then you should take action. As stated, the notification means that your mailbox on the mail server (not on your own computer) has gone over 75% of the allocated space. Login to your Mail Control Panel to view your disk usage. Here you can view the individual mailbox quota assigned to each account and the space used by each account. After viewing your current disk usage, you may wish to allocate any free space available to your email account(s) or change the allocated email quota assigned to your email account(s). Once you have identified the email account(s) that are full, login to each of the particular email account(s) using Webmail. Removing email from webmail will free up space in the mailbox. If you only use Webmail or access your mail using an IMAP account, then removing these emails will permanently delete them. You can also check for spam or sent messages in their respective folders as these can often take up significant space as well. Finally, remember to empty the trash folder (purge). If you use an email client to check your email (for example, Outlook, Windows Mail, Mozilla Thunderbird, Mac Mail, etc), you can configure your client to remove old email off the mail server to automatically tidy up your mailbox. To enable this for your POP account, go into the settings of your email client - go into the mail account and usually under the "advanced" section you will find the appropriate settings. 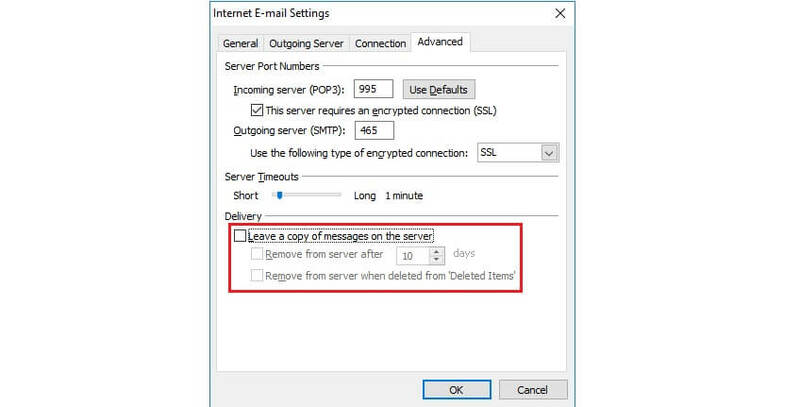 Here you can untick the option to "leave a copy of messages on the server" or set the number of days before your email client will remove any messages from the mail server. We recommend you do not leave a copy of messages on the server or reduce the number of days before removing messages from the mail server to say 3-5 days. If there is no more space available to allocate across your accounts, you may wish to consider upgrading your hosting package to the next plan. You can upgrade your service to a package which better suits your requirements at any time.